Akkadian Seal: Nergal with a curved sword in his left hand and a mace, flanked by two branches ending in feline heads. His right foot rests on the body of a man lying at the base of a mountian. The nine column inscription on this seal identifies the figure as Nergal. Iraq Museum, Baghdad. Made of steatite (soapstone), c. 23602180 BCE. Actual size 4.2 cm high, 2.7 cm. diameter. 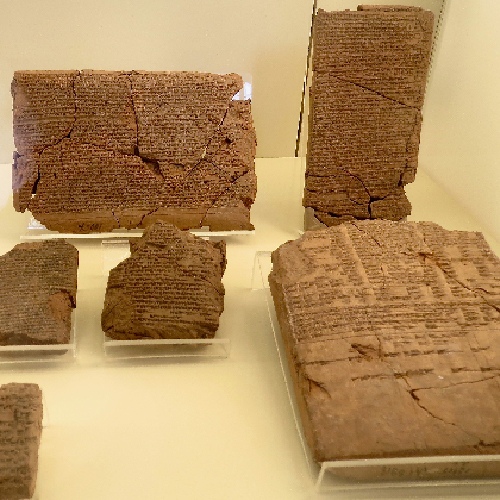 Cuneiform documents containing ritual, prayers, incantations against witchcraft and the “evil eye,” and a vision of the underworld. Assyria. 9/7 century BCE. Pergamon Museum, Berlin.